Throughout the year, the Lichfield Discovered group has hosted some fascinating talks on a range of subjects from symbolism in cemeteries (we never did find out about the mackerel!) to urban exploration and we’ve visited pubs, the Cathedral Close, Roman forts, pill boxes and tunnels. Before we hang up our boots and put the lid back on the biscuit tin for 2014, we have two more events coming up, which I want to let people know about. 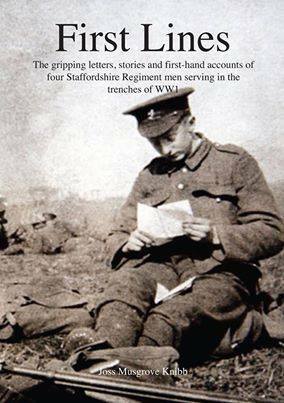 This coming Monday (10th November), we are delighted to welcome local author and journalist Joss Musgrove Knibb who will be taking a look at the previously unpublished letters of four Staffordshire Regiment soldiers who fought, and in some cases died, in the trenches of WW1. The vibrant letters of Alfred Bull of Lichfield, Sydney Norton of Tamworth, James Stevenson of Stoke-on-Trent and Jake Armes on the 1914 Christmas Truce bring the voices of these men vividly to life. With lots of photographs, stories and ‘trench humour’, it will be a thought provoking way of marking the centenary. The event takes place at 7pm at St Mary’s in the Market Square, Lichfield. There is no charge, but donations towards the centre are always appreciated. The letters are part of Joss’ recently published book – First Lines. First Lines is published by Gazelle Press and is available to purchase across the region. Local outlets include WH Smiths (Three Spires Shopping Centre), St Mary’s Heritage Centre, The Cathedral Shop and the National Memorial Arboretum. First Lines retails at £9.99. On Saturday 15th November we are meeting at the Guildhall at 2pm, where we’ll be exploring what remains of the city’s old gaol, first opened in 1548. 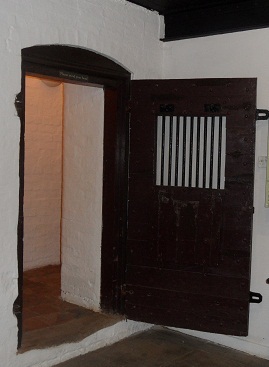 After three hundred years, changes in the law meant that Lichfield’s prisoners were transported to Stafford after their trial, but a small number of cells were retained and used as the city lock-up. In 1847, the Inspector of Prisons visited the gaol and found that ‘the initials and names of many prisoners were cut deep into the wood work’. On our visit we’ll be attempting to locate and record this graffiti and have access to some of the cells which are not usually open to the public. Any names or initials that are discovered will then be compared with prison documents held by Lichfield Record Office at a later date. As it would be good to have an idea of numbers (it might get a bit cosy in those cells if there are too many of us! ), please let me know if you would like to join us. We also need people to bring torches and cameras to help with the recording process. 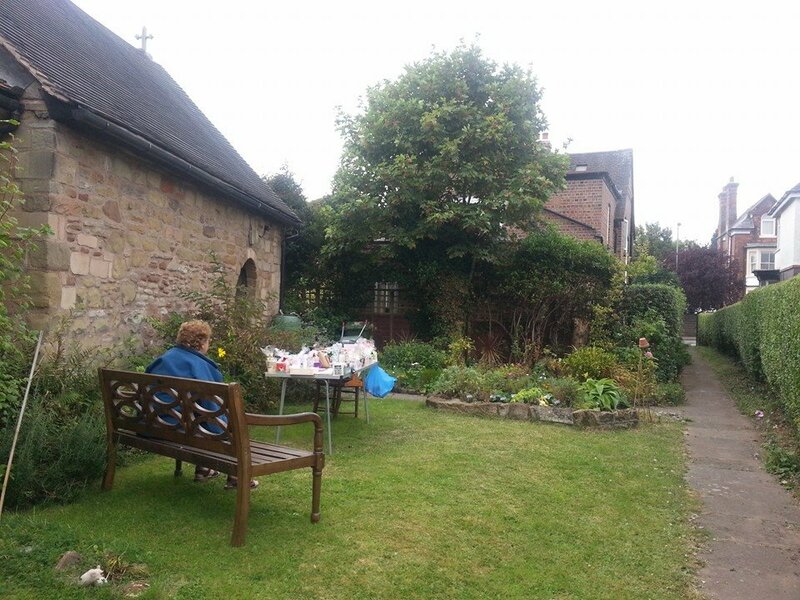 We’re currently working on next year’s programme of events for Lichfield Discovered but so far we’ve pencilled in a visit to the Spital Chapel – one of Tamworth’s oldest and loveliest buildings, a talk on Holy Wells of the Midlands, a visit to the timber framed Sinai Park House (where there’s also a holy well!) and closer to home, an exploration of Beacon Park and Beacon Street. As ever, we are open to suggestions and so if there’s anywhere you’d like to visit, or anything you’d like to know more about, tell us and we’ll see what we can do! Dates to follow, so watch this space. You can also keep up to date by following us on twitter @lichdiscovered or liking us on Facebook. Spital Chapel of St James, Tamworth. During an archaeological dig in the latter half of the 20thc, to find any earlier structures on site, three skeletons were unexpectedly discovered in the area where the table is. 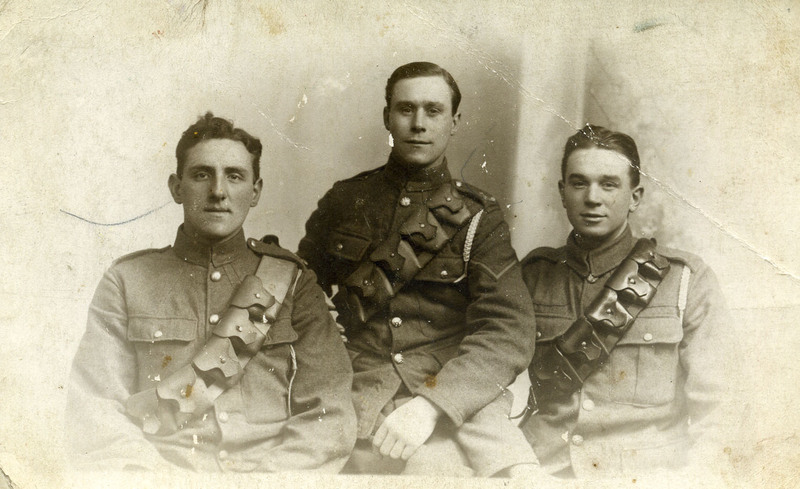 Ron Myatt of the Great Wyrley Local History Society has been back in touch with the names of the other two members of the Staffordshire Yeomanry pictured here with a young Frank Halfpenny at some time during the First World War. 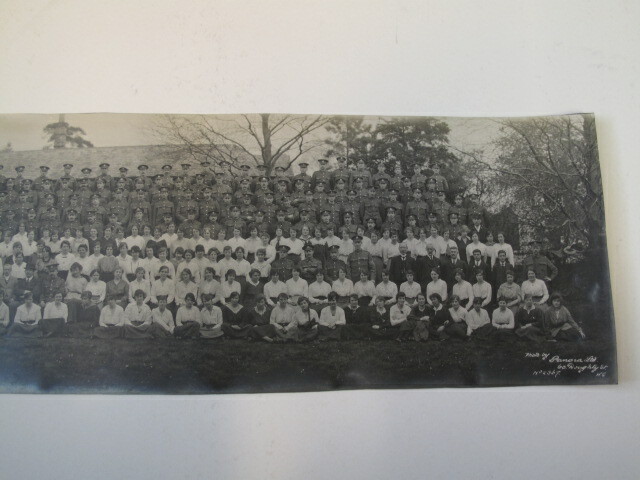 In the centre of the photograph is Albert Handley, and Ron has very kindly passed on to me the following information given to him by Albert’s son. Albert Handley was born in Bridgtown in 1893. 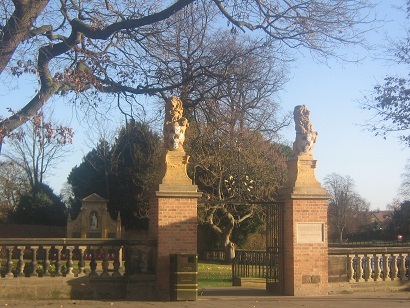 He was the second son of Jairus and Elizabeth Handley (formerly from Willenhall) and brother of Charles, Ellen, Ethel and Maud. The family moved to moved to Landywood (part of Great Wyrley) and Jairus Handley worked in several pits. Albert was educated at Great Wyrley Council School and left aged 14. Afterwards he went to the Evening Institute where he learnt mathematical skills and secretarial techniques. Albert worked in brickyard in Bridgtown before taking a clerical post with Siemens Electrical, Stafford. 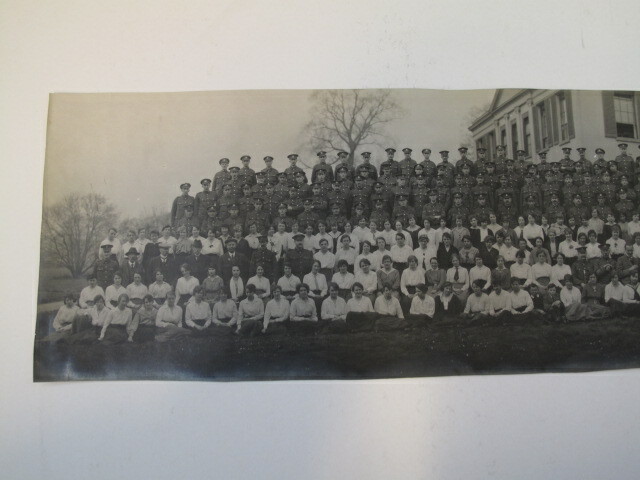 Although Albert was employed in a ‘reserved occupation’, in 1915 he managed to enlist in the Staffordshire Yeomanry, where he served until 1919. 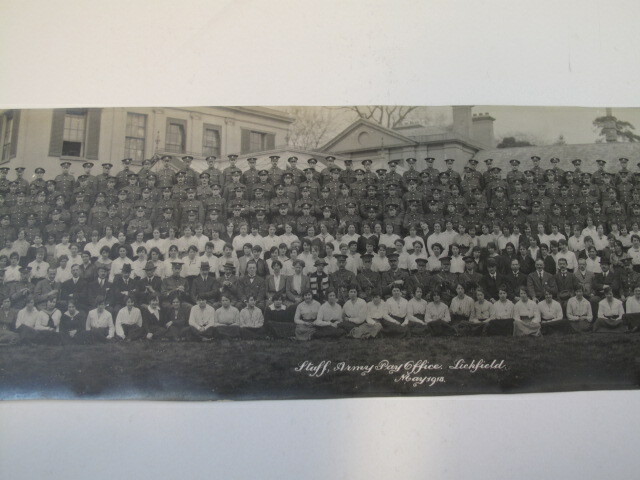 After mustering at Burton on Trent, the 3rd / 1st Staffs Yeomanry were affiliated to the 12th Reserve Cavalry Regiment at Aldershot where Albert learned to ride horses and was promoted to NCO rank. In 1916, they served in Egypt, Palestine and Syria. During his service, Albert contracted a near-fatal dose of malaria. Back home, Albert met Winifred Sambrook ,an infant school teacher, and they were married in 1924. Between 1919 and 1949, he was employed as a clerk at a large mine but also took on additional roles including church officer, society steward and Trustee of Wyrley Wesley Methodist Church. Albert also helped to set-up the fund for first Doctor’s Practice, was the founding Treasurer of the Wyrley Branch of the Nursing Association, and set-up a branch of the Ideal Benefit Society collecting subs and making pay-outs. In 1937, Albert was appointed clerk of the Parish Council which brought with it a large range of duties including opening libraries, supervising burials, responsibility for recreation grounds and tennis courts as well as administrative tasks. 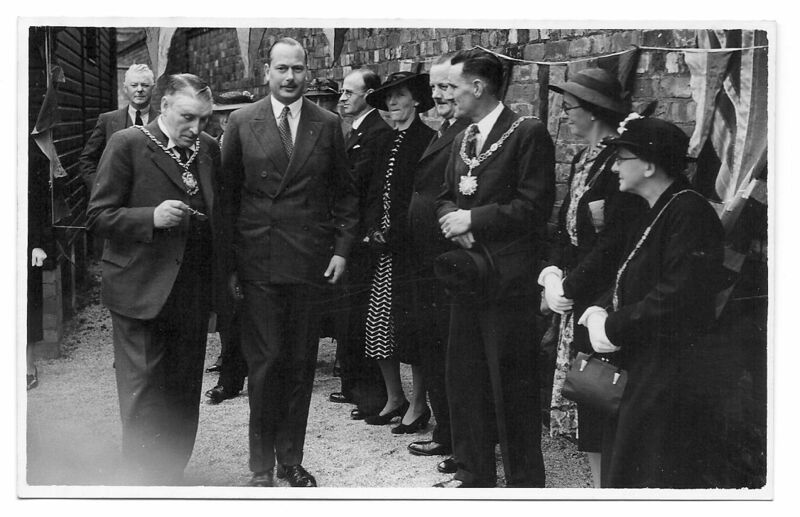 In 1949, he became a Magistrate for Cannock and Penkridge Bench in 1939, eventually being elected chair. During the Second World War, Albert was a founding member of Civil Defence Corps in 1939, who were responsible for recruiting wardens, issuing gas masks, organising training and dealing with the arrival and billeting of evacuees from Margate. In 1949, Albert became a local Government Officer in the Rating Department of Cannock RDC. Albert died in 1975. 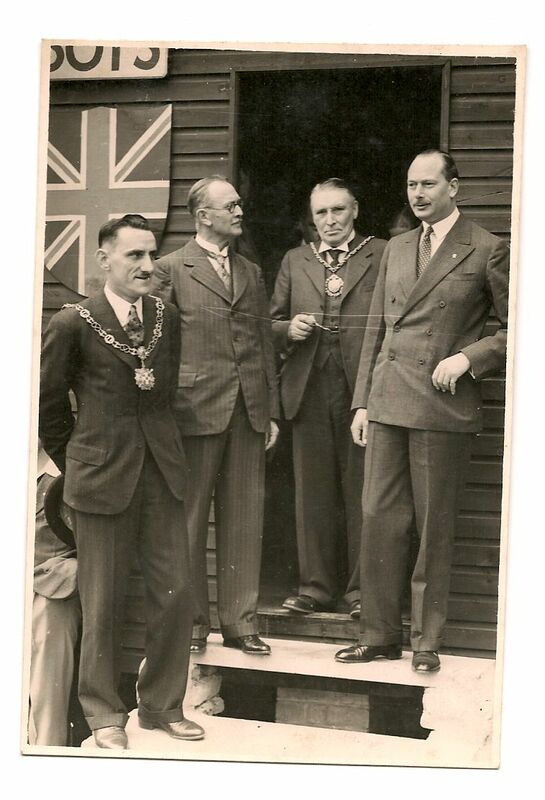 The third man in the photo is Percy Johnson, who Ron believes was Lichfield farmer. However, we know nothing more about Percy, and would be grateful to hear from anyone who is able to help. I’d also be interested to know the story behind this photograph. Why were Frank, Albert and Percy photographed together, and when was the photograph taken? 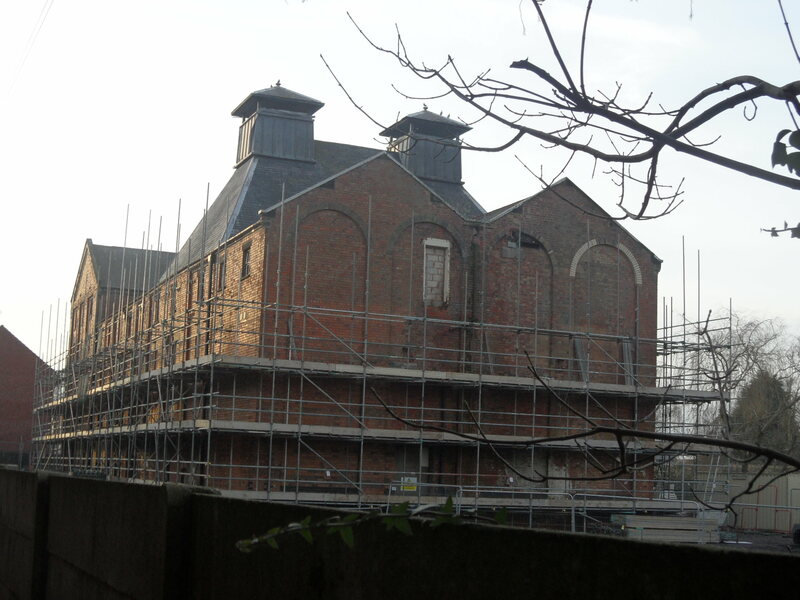 If you do have any further information on any of the above, please send me an email or leave a comment below, or alternatively you can leave a message for Ron on the Great Wyrley Local History Society guestbook here. To the honoured memory of Alfred Cleveley Sergeant South Staffordshire Regiment. He was in service at Elmhurst Hall and enlisted in August 1914 and fought in Gallipoli and in France where he gained the military medal and fell in action on May 12th 1917 aged 32. The memorial was given by Alfred’s former employer, Mrs Hamer, who was renting the now demolished Elmhurst Hall at the time. Before coming to Elmhurst Alfred, who was originally from Powick in Worcester, had been employed as a ‘house and garden boy’ at The Rectory in Shobdon in Herefordshire in 1901 and as a butler at Aldersey Hall in Cheshire in 1911, possibly the position he left to come to Elmhurst Hall. I’ve found Alfred’s medal card at the National Archives (as well as the Military Medal, Alfred also received the British War Medal, the Victory Medal and the 1914/15 Star), and the Commonwealth War Graves Commission record that tells us that his name is inscribed on the Arras Memorial. 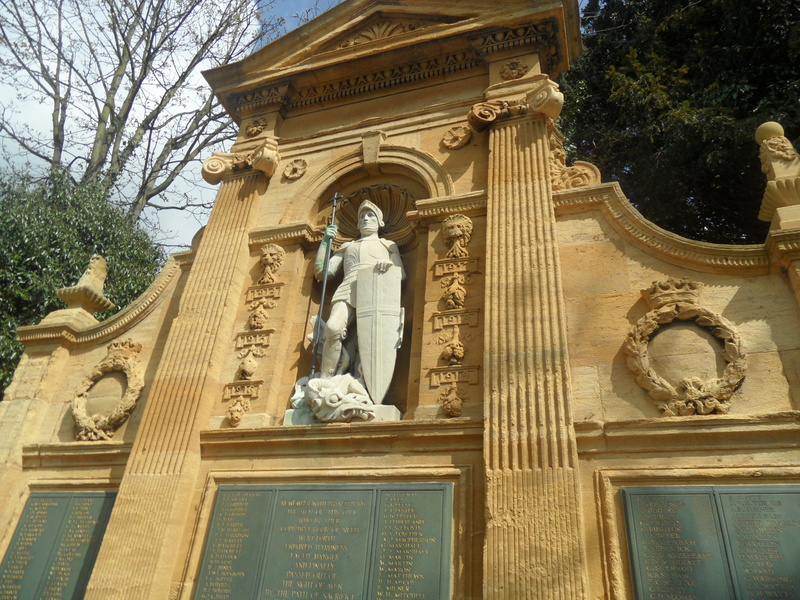 However, one thing I can’t find is his name on the main War Memorial in the Garden of Remembrance near to Minster Pool. ‘This being a City Memorial, it was decided to limit the names to be inscribed to those born in the City, or whose house or permanent address at the time of joining the Imperial Forces was within the City and who lost their lives in the war…Further, the great sacrifice made by those whose names are here recorded was an equal one, and we decided that the names only, without rank or unit, should be recorded in alphabetical order’. Presumably then, living and working at Elmhurst Hall wasn’t classed as having a permanent address in Lichfield? I wonder if this was a standard approach for those in service? I also wonder how common it was for employers to commemorate their domestic staff? Actually, I did notice for the first time that not all of the names are in alphabetical order which suggests that some may have been added at a later date? I’m very grateful to Steve Lightfoot who has been making some enquiries regarding the time that Sergeant Alfred Cleveley spent in the 1st Battalion of the South Staffs regiment, and the regiment’s role in the Battle of Arras where it seems he lost his life. I’m looking forward to hopefully hearing more of Alfred’s story but one final question for the time being – where are Alfred’s medals now?